The story: The 2015 edition of Four Roses’ Limited Edition Small Batch is a tribute to longtime Master Distiller Jim Rutledge, who will retire as of tomorrow, Sept. 1, after 49 years of working in the bourbon business. Brent Elliot, who has been selecting limited editions along with Jim for several years, will become the new Master Distiller. 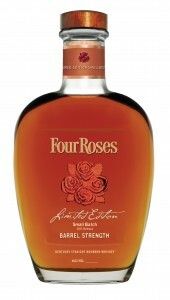 The 2015 Limited Edition is a blend of four of Four Roses’ 10 recipes: a 16-year-old OBSK, a 15-year-old OESK, a 14-year-old OESK and an 11-year-old OBSV. “This combination of mature bourbons is something truly special,” Jim Rutledge said in a news release that accompanied my review sample. “It’s great when you can go out on a high note, and this bourbon delivers that.” As always, the LE Small Batch arrives for National Bourbon Heritage Month, and approximately 12,600 bottles will appear in retail outlets in mid-September. The taste: Spicy on the front, but not hot; not quite licorice – more like old-timey horehound candy. There’s a nite of that citrus near the back of the palate, followed by a long, smooth, minty finish. The verdict: This Small Batch brings more mint and spice than previous iterations, thanks to that K yeast strain that Jim likes so much, but the V strain in the 11-year-old adds some delicate fruit flavors, and of course, Jim would never release a bourbon that didn’t have a nice, long finish. I agree: Jim is leaving on a high note. So long, and thanks for all the bourbon. I hope it makes it to northern Indiana!